Drawing from groundbreaking research, psychologist and award-winning teacher Kelly McGonigal, PhD, offers a surprising new view of stress—one that reveals the upside of stress, and shows us exactly how to capitalize on its benefits. You hear it all the time: stress causes heart disease; stress causes insomnia; stress is bad for you! But what if changing how you think about stress could make you happier, healthier, and better able to reach your goals? Combining exciting new research on resilience and mindset, Kelly McGonigal, PhD, proves that undergoing stress is not bad for you; it is undergoing stress while believing that stress is bad for you that makes it harmful. In fact, stress has many benefits, from giving us greater focus and energy, to strengthening our personal relationships. McGonigal shows readers how to cultivate a mindset that embraces stress, and activate the brain's natural ability to learn from challenging experiences. Both practical and life-changing, The Upside of Stress is not a guide to getting rid of stress, but a toolkit for getting better at it—by understanding, accepting, and leveraging it to your advantage. Kelly McGonigal, PhD, is a health psychologist and lecturer at Stanford University, and the author of the international bestseller The Willpower Instinct (Avery, 2011). As a leader in the field of "science help," McGonigal is passionate about translating cutting-edge research from psychology, neuroscience, and medicine into practical strategies for health, happiness, and personal success. McGonigal has taught for a wide range of programs at Stanford University, including the School of Medicine, the Graduate School of Business, and Stanford Continuing Studies, where her popular public courses include "The Science of Willpower" and "How to Think Like a Psychologist." She has received Stanford's highest teaching honor, the Walter J. Gores award, for her undergraduate psychology teaching. Through her work with the Stanford Center for Compassion and Altruism Research and Education, she studies methods for training mindfulness, empathy, and compassion. Her research has appeared in such journals as Motivation and Emotion, the Journal of Happiness Studies, and the Journal of Personality and Social Psychology. "Often we regard stress as a regrettable but necessary evil -- the heavy price we pay for achievement in a fast-forward, competitive, “always on” world. In this important and engaging book, Kelly McGonigal challenges us to discard that familiar, fear-based mindset and embrace stress as a path to realizing our most creative potential." "The upside of Kelly McGonigal is that she not only shows how what we thought we knew about stress was backwards, but that getting it right will change your life for the better. This book provides an accessible user’s guide to leveraging the most cutting edge research in psychology and neuroscience to enhance your health and well-being." For those individuals and teams that discover that stress is life's secret ingredient, they will be rewarded with expanded self confidence and rapidly growing organizations. 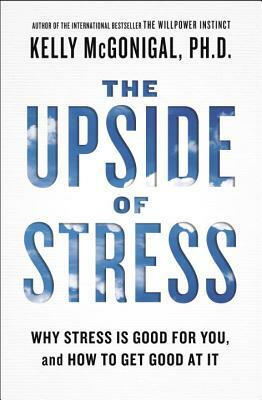 If you’ve ever complained of being stressed out, you need to read this perceptive, thought-provoking book. Kelly McGonigal reveals the surprising truth about why we should embrace the many unsung benefits of stress. The Upside of Stress will change the way you think—and it will change your experience of your life. The message that stress can actually convey health benefits is important and needs to be heard. This thoughtful analysis on the role of mindset will prompt you to re-think your relationship with stress, and help you realize its benefits. "Tired of the endless debate about whether man possesses free will or is predestined to lounge about gobbling Krispy Kreme donuts while watching TV? If you want action, not theory, The Willpower Instinct is the solution for the chronically slothful."